Also known as: "The Greatest"
Muhammad Ali (born Cassius Marcellus Clay, Jr. on January 17, 1942) AKA "The Greatest". 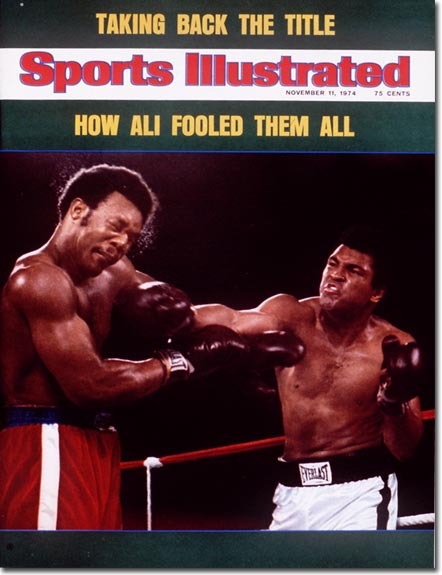 In 1999, Ali was crowned "Sportsman of the Century" by Sports Illustrated. He won the World Heavyweight Boxing championship three times, and won the North American Boxing Federation championship as well as an Olympic gold medal. On August 23, 1966, Muhammad applied with the Selective Service for conscientious objector status on religious grounds (as a minister with the Nation of Islam). In what became an extensive legal, political, professional, and personal battle, Ali was convicted of draft evasion, stripped of his boxing title, and became a lightning rod — and a voice — for opinions on the Vietnam War. Muhammad Ali's willingness to speak out against racism in the United States, and the affect it had on domestic and foreign policy, earned him many supporters and detractors. During the time Muhammad Ali was unable to box he gave speeches on college campuses against the Vietnam War and racism . In 1971, nearly five years after it began, Ali's legal battle finally culminated with a unanimous decision (8-0 with Thurgood Marshall abstaining) by the United States Supreme Court overturning his draft conviction. Muhammad Ali transcended the sports world and became a man known globally as an activist and a positive citizen of the world. He did not care about money he cared about his beliefs and values. "Float like a butterfly, sting like a bee, there will be no other like Ali." 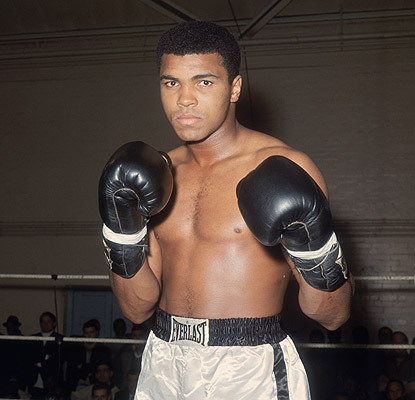 Born Cassius Marcellus Clay, Jr.; name changed to Muhammad Ali, 1963; born January, 17, 1942, in Louisville, KY; son of Cassius (a piano player) and Odessa Clay (both deceased); first wife, Belinda; second wife, Aaisha; third wife, Veronica Porche; fourth (and current) wife, Yolanda Williams, married in 1986; children: nine (one with Yolanda). Religion: Muslim. Addresses: Home--P.O. Box 187, Berrien Springs, MI 59103. Former world heavyweight boxing champion. 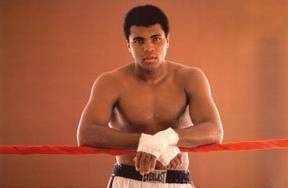 Began professional career, 1960; initially became heavyweight champ, 1964; stripped of title and boxing license over refusal to participate in the Vietnam War, 1966; retired from boxing, 1981. Appeared in film The Greatest, 1976, and television film Freedom Road. Olympic Gold Medal in boxing, 1960; six Kentucky Golden Gloves titles; National Golden Gloves titles, 1959-60; World Heavyweight Championship, 1964-67, 1974-78, 1978-79; U.S. Olympic Hall of Fame, inductee, 1983; named the greatest heavyweight champion of all time, Ring Magazine, 1987; International Boxing Hall of Fame, inductee, 1990; Jim Thorpe Pro Sports Award, Lifetime Achievement, 1992; Muhammad Ali Museum, Louisville Galleria, opened 1995; Essence Award, 1997. (With Richard Durham) The Greatest: My Own Story, Random House, 1975. Three-time world heavyweight boxing champion Muhammad Ali, known for his lyrical charm and boasts as much as for his powerful fists, has moved far beyond the boxing ring in both influence and purpose. Ali won an Olympic gold medal and later tossed it into a river because he was disgusted by racism in America. As a young man he was recruited by Malcolm X to join the Nation of Islam. He refused to serve in Vietnam--a professional fighter willing to serve time in jail for his pacifist ideals. He has contributed to countless, diverse charities and causes. And his later years have found him interested in world politics as he has battled to keep Parkinson's disease at bay. He's still the most recognizable man on earth. And over forty years after he burst onto the scene as a gold-medal winner at the 1960 Rome Olympics, Muhammad Ali remains a magical figure, known and loved throughout the world. Dubbed "Athlete of the Century" by GQ magazine, Muhammad continues to receive accolades for his contribution to sports. He has been named Sports Illustrated's "Sportsman of the Century," the BBC's "Sports Personality of the Century," the World Sports Award's "World Sportsman of the Century," and the State of Kentucky's "Kentuckian of the Century." In 2005, he received the United States of America's highest civil award, the Presidential Medal of Freedom. As a boxer, Muhammad brought unprecedented speed and grace to his sport, while his charm and wit changed forever what the public expected a champion to be. His accomplishments in the ring are the stuff of legend – two fights with Sonny Liston, where he proclaimed himself "The Greatest" and proved he was; three epic wars with Joe Frazier; the stunning victory over George Foreman in the Rumble in the Jungle; and dethroning Leon Spinks to become heavyweight champion for an unprecedented third time. 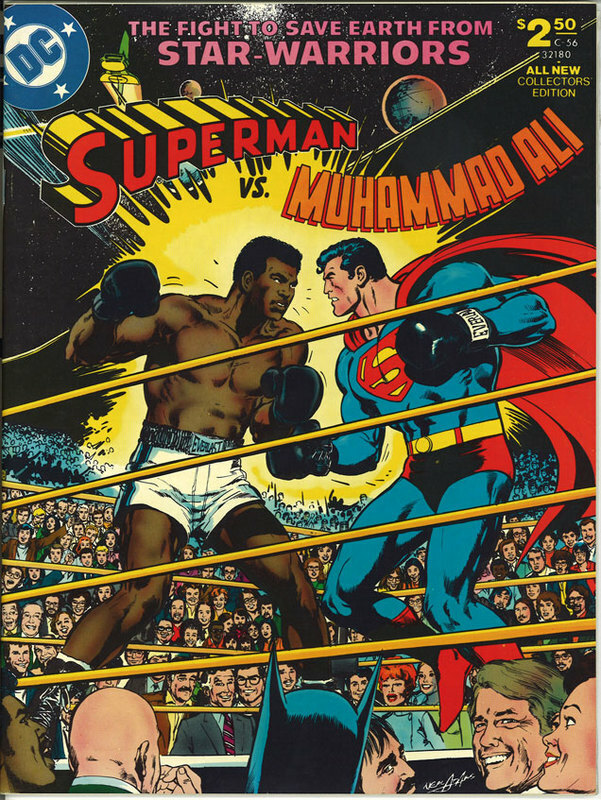 But there was always far more to Muhammad than what took place in a boxing ring. 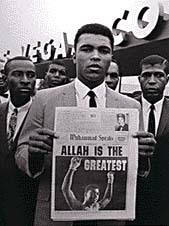 Muhammad's life and career have been played out as much on the front pages of newspapers as on the inside sports pages. 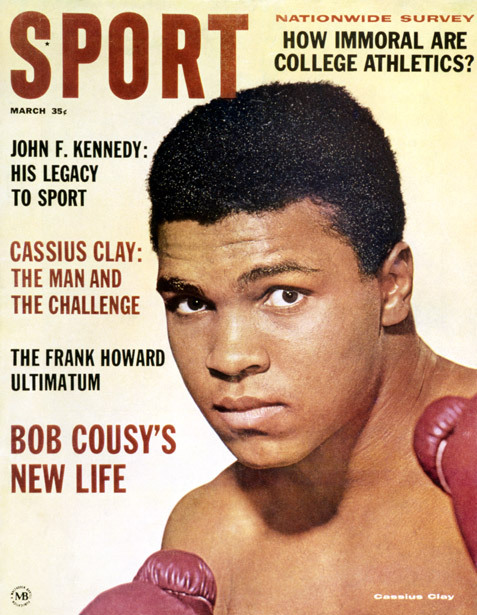 His early embrace of the Nation of Islam and his insistence on being called Muhammad Ali instead of his "slave name," Cassius Clay, heralded a new era in black pride. His refusal to be inducted into the United States Army anticipated the growing antiwar movement of the 1960's. His willingness to stage his much-promoted and publicized fights in such far-flung locales as Kinshasa, Manila, and Kuala Lumpur signaled a shift from superpower dominance toward a growing awareness of the developing world. Daring to go against political policy to help people in need, Muhammad has made goodwill missions to Afghanistan and North Korea; delivered sorely-needed medical supplies to an embargoed Cuba; traveled to Iraq and secured the release of 15 United States hostages during the first Gulf War; and journeyed to South Africa to meet Nelson Mandela upon his release from prison. Today, championing the causes of the developing world has become a major focus of Muhammad's life. He has been instrumental in providing over 232 million meals to the world's hungry. Traveling across continents, he has hand-delivered food and medical supplies to children in Cote D'Ivoire, Indonesia, Mexico, and Morocco among other countries. In addition to his international efforts, Muhammad is equally devoted to helping charities at home. He has visited countless numbers of soup kitchens and hospitals, and helped such organizations as the Make-A-Wish-Foundation and the Special Olympics. He annually participates in "Fight Night," which generates funds for the Muhammad Ali Parkinson Research Center at Barrow Neurological Institute, in Phoenix, Arizona. At the State Capitol in Michigan, he advocated new laws for protecting children. He is also the namesake of the Muhammad Ali Boxing Reform Act (sponsored by Senator John McCain), a law that regulates professional boxing to protect boxers from unscrupulous promoters and poor health and bout conditions. In recent year, Muhammad has testified before the United States Senate several times regarding boxing reform. For his humanitarian efforts, Muhammad has been the recipient of countless awards. In addition to being honored by Amnesty International with their Lifetime Achievement Award, the Secretary-General of the United Nations bestowed upon him the citation of United Nations Messenger of Peace. In Germany, he was honored with the 2005 Otto Hahn Peace Medal for his involvement in the U.S. civil rights movement and the United Nations. He was also named the International Ambassador of Jubilee 2000, a global organization dedicated to relieving debt in developing nations. Other honors include an Essence Award, an XNBA Human Spirit Award and recognition from the National Urban League; 100 Black Men; Givat Haviva; the Oleander Foundation; The National Conference of Christians and Jews; Time magazine; and former President Jimmy Carter, who cited Muhammad as "Mr. International Friendship." Ever the entertainer, Muhammad has appeared in several motion pictures, including the big-screen adaptation of his first autobiography, The Greatest, playing himself. His life has been the subject of numerous films, including the Academy Award-winning documentary When We Were Kings and the Michael Mann's biopic, ALI, starring Will Smith. Muhammad also starred in Freedom Road, and made guest appearances on numerous popular television series ranging from Diff'rent Strokes to Touched by an Angel. 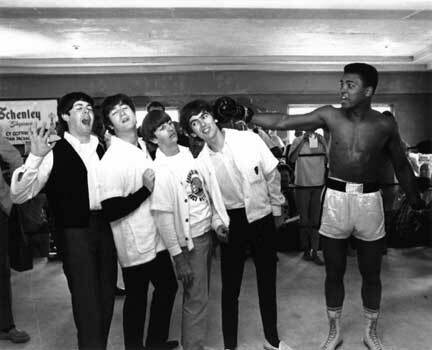 He also starred on Broadway in the musical, Big Time Buck White, and recorded a popular album, I Am The Greatest! Muhammad recently published a memoir entitled, The Soul of a Butterfly: Reflections on Life's Journey, in which he discusses the meaning of religion, forgiveness, and some of the defining moments in his life and career. He is also the co-author of Healing: A Journal of Tolerance and Understanding and The Greatest: My Own Story. In 2005, Muhammad opened the Muhammad Ali Center in his hometown of Louisville, Kentucky. In addition to displaying a selection of his memorabilia, the Center's exhibits focus on themes of peace, social responsibility, respect and personal growth. In 2006, he partnered with CKX, Inc. to form Muhammad Ali Enterprises, for the licensing of his name, image and likeness and to continue promoting his cultural and philosophical legacy throughout the world. Muhammad has nine children: Maryum, Rasheeda, Jamillah, Hana, Laila, Khaliah, Miya, Muhammad Junior, and Asaad. He is married to the former Lonnie Williams of Louisville, whom he has known since her family moved across the street from the Clay family when she was 6 years old. Whether promoting tolerance and understanding, feeding the hungry, studying his religion, or reaching out to children in need, Muhammad Ali is devoted to making the world a better place for all people. No athlete has ever contributed more to the life of his country, or the world, than Muhammad Ali. Who would've thought that a stolen bike was the key to the beginning of the Muhammad Ali story? But it was. In 1954 in Louisville, Kentucky, 12-year-old Cassius Marcellus Clay's bike was stolen while he and a friend were at the Columbia Auditorium. Young Cassius found a cop in a gym, Joe Martin, and boiling with youthful rage, told Martin he was going to "whup" whoever stole his bike. Martin admonished, "You better learn to box first." Within weeks, 89-pound Cassius had his first bout—his first win. For the next 27 years, Cassius would be in that ring. Even in his youth, he had dreams of being heavyweight champion of the world. But his life would take turns that no seer could've predicted. Young Cassius dedicated himself to boxing with fervor unmatched by other young boxers. Indeed, it was his only activity. As a teenager, he never worked. He boxed and trained. He had 108 amateur bouts. According to Joe Martin, Clay set himself apart from the other boys by two things: He was "sassy," and he outworked all the other boys. The work paid off: 6 Kentucky Golden Gloves championships; two National Golden Gloves championships; two National AAU titles before he was 18 years old. 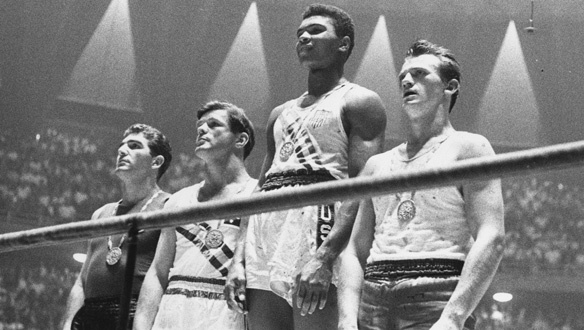 And the son of Odessa, whom he lovingly referred to as "Bird," and Cassius senior, "Cash," to everyone, won the Olympic Gold Medal in 1960 in Rome months after his 18th birthday. When he returned from Italy, having just won an Olympic gold medal, he was so proud of his trophy that he wore it day and night and showed it to everyone, whether they wanted to see it or not. In the Philadelphia Inquirer Ali's first wife remembered him saying "I was young, black Cassius Marcellus Clay, who had won a gold medal for his country. I went to downtown Louisville to a five-and-dime store that had a soda fountain. I sat down at the counter to order a burger and soda pop. The waitress looked at me.... 'Sorry, we don't serve coloreds,' she said. I was furious. I went all the way to Italy to represent my country, won a gold medal, and now I come back to America and can't even get served at a five-and-dime store. I went to a bridge, tore the medal off my neck and threw it into the river. That gold medal didn't mean a thing to me if my black brothers and sisters were treated wrong in a country I was supposed to represent." At the time, Cassius was managed by the Louisville Sponsoring Group, a consortium of wealthy local white businessmen. The LSG, as it became known, put young Cassius with veteran trainer, Angelo Dundee, after failed attempts with the Mongoose, Archie Moore, and a turn down by Ali's boxing idol, Sugar Ray Robinson. With Dundee in his corner, from his Miami base, Cassius blazed a trail through the heavyweight division with his unorthodox style that defied boxing logic. He was a "headhunter." He never threw body shots (he adopted this style in his youth because he had reach and because he didn't want to get close enough to get hit). And he "danced." Because of Clay's powerful legs—maybe the strongest in the history of boxing—he literally floated in the ring. He invented the "Ali Shuffle;" a foot maneuver where he would elevate himself, shuffle his feet in a dazzling blur, and sometimes deliver a blow while dancing. The third element that Clay brought to boxing was his mouth. He never shut up. He became known as, "The Louisville Lip." It was more than banter; it was a constant harangue. 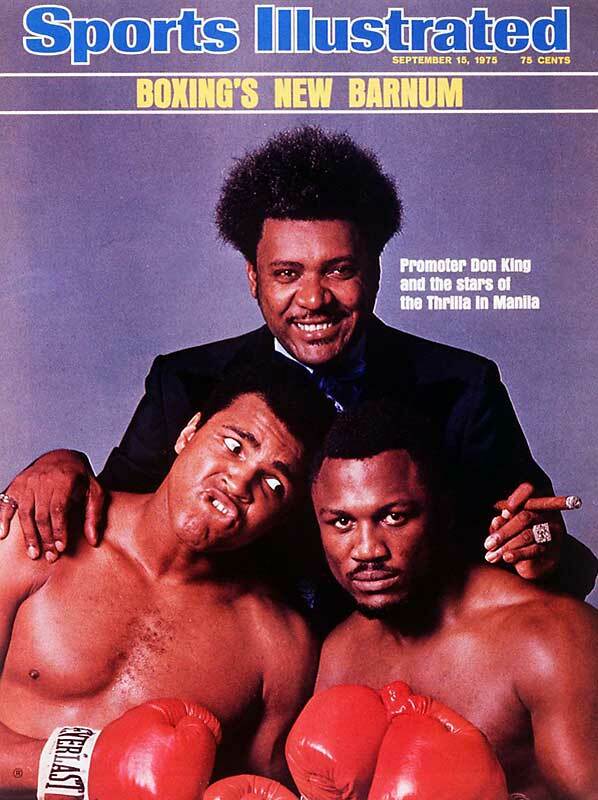 In a time when boxers never talked to the media—their managers always spoke for them—Clay did all his own talking. He even went so far as to predict the round. "To prove I'm great he will fall in eight!" While training for his title bout against the fearsome heavyweight champion, Sonny Liston, Clay met Cap'n Sam, a Nation of Islam minister of the local Miami mosque. 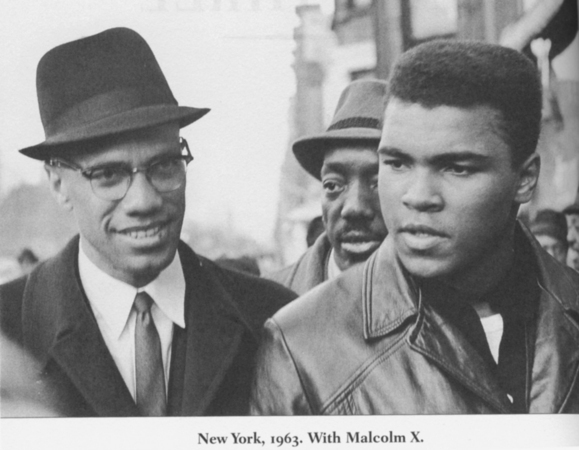 Cap'n Sam introduced Cassius to NOI spokesman, Malcolm X. Malcolm and young Cassius bonded on a deep level. Malcolm brought Cassius into the Nation of Islam. 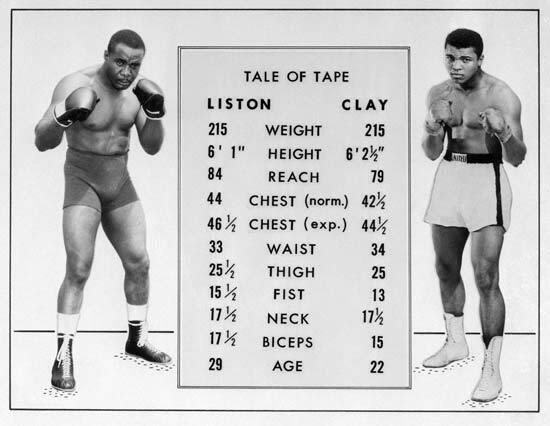 Despite the 7-1 odds, Clay upset Sonny Liston in Miami and became heavyweight champion of the world in 1964. The next day, Clay announced to the world that he was a member of the Nation of Islam and that his name was Cassius X. The X reflecting the unknown name that was taken from him by the slave owners centuries before. The national response was immediate, negative and intense. 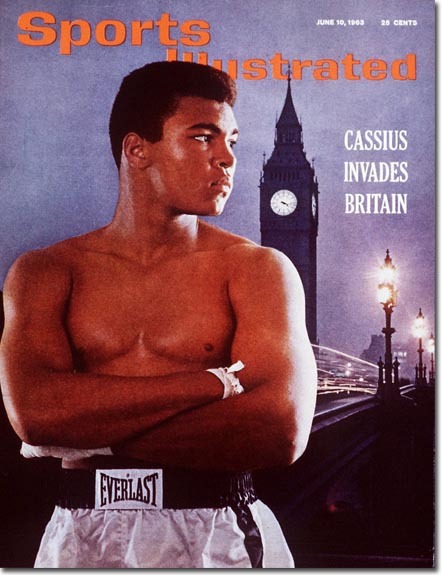 Cassius X, soon to be given the name Muhammad Ali, by NOI founder, "The Messenger," the Honorable Elijah Muhammad, chose to disassociate himself from his friend and mentor Malcolm X after the Messenger suspended Malcolm. Herbert Muhammad, eldest son of Elijah, was installed as Ali's new manager as Ali continued to defend his crown against all comers. In 1967, as the Vietnam War was escalating, Ali was called up for induction into the Armed Services. Ali refused induction on the grounds of religious beliefs. He was, in fact, a practicing Muslim minister. This refusal led to the now-famous Ali quote, "I ain't got no quarrel with them Vietcong..."
The national furor over that comment combined with Ali's refusal to be inducted into the Armed Services, caused virtually every state and local entity in America to cancel Ali's boxing licenses. Ali's final fight of 1967 was against Ernie Terrell, who incensed Ali at the weigh-in by calling him "Clay." Ali pounded him in the ring with taunts of, "What's my name?!!" Ali did not fight again for 2 ½ years. He was stripped of his championship title, his passport taken; all his boxing licenses were cancelled. He lost an initial court battle and was facing a 5-year prison term. Ali made money during his exile by speaking at colleges. He was the first national figure to speak out against the war in Vietnam. 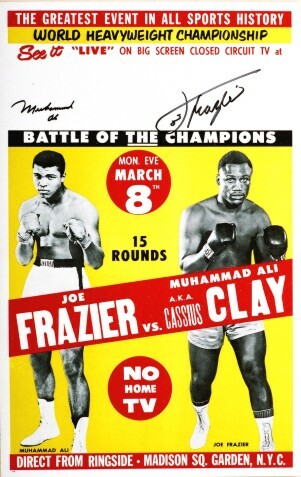 In 1970, after a 2 ½ year layoff, and with the mood of the country changing, Ali staged his comeback, first against Jerry Quarry in Atlanta then for what was billed as, "The Fight of the Century," his first match against undefeated champ, Joe Frazier at Madison Square Garden on March 8, 1971. Ali fought valiantly, but lost. The 2 ½ year exile had cost Ali his legs. He could no longer dance. He lost that night in the Garden, but months later he won his biggest fight, the Supreme Court reversed his conviction and upheld his conscientious objector claim. Ali was free of the specter of jail, and free to travel to box anywhere in the world. Several matches followed, including an unexpected loss to ex-Marine, Ken Norton; a win in their next bout; an uninspired win against Joe Frazier. 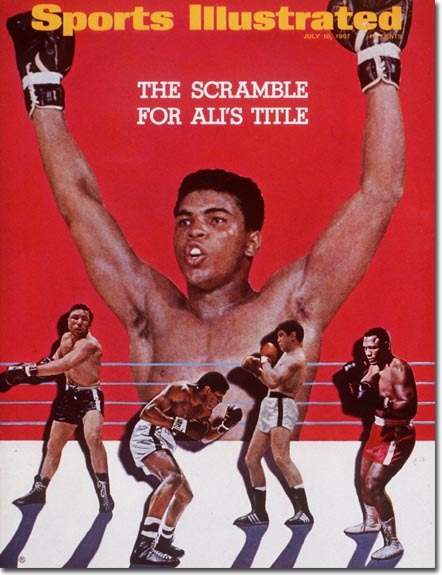 But these matches were but window dressing for the biggest match of Ali's career: The Rumble In the Jungle. George Foreman was a fearsome champ. He had thunder and destruction in both hands. He had easily knocked out Ken Norton and had lifted Frazier off the mat with one blow. Promoter Don King got the government of the African nation of Zaire to guarantee the unheard of sum of 10 million dollars for the fighters. 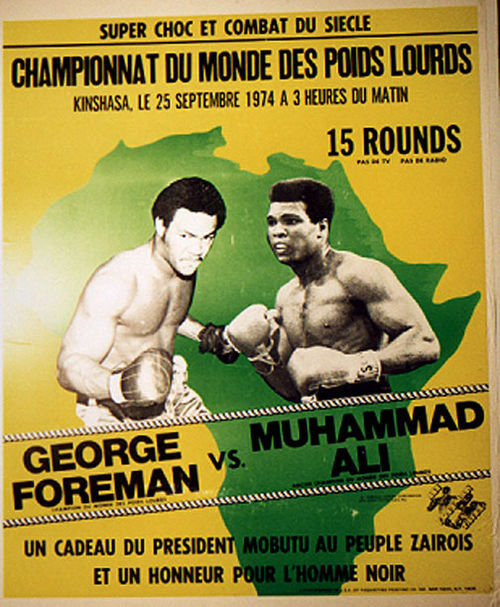 In Kinshasa, Ali derived strength from the African people. They adored him. They yelled, Ali Bomaye! (Ali kill him). Going into the fight, Ali was 3-1 underdog. His fight doctor, Ferdie Pacheco, had a jet ready to spirit Ali away to a neurological hospital in Spain after the fight. But Ali had other ideas. 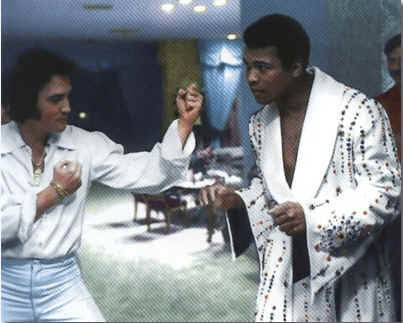 Because of the heat, Ali realized he couldn't dance from Foreman for the whole fight. 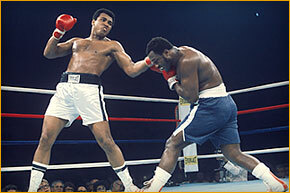 He invented "The Rope-A-Dope," a strategy that allowed Foreman to pound on him until Foreman tired. 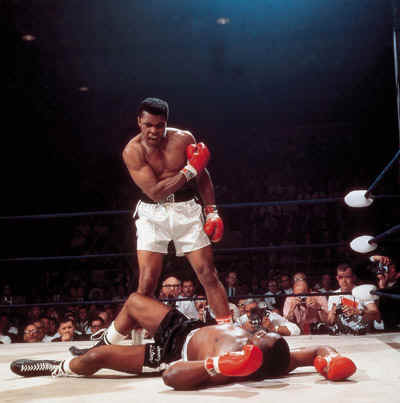 His corner men yelled at him to get off the ropes, but Ali persisted with his strategy for seven rounds and then in the eighth round, when Foreman was spent, Ali came off the ropes and scored a shocking knockout! Ali was the king again. 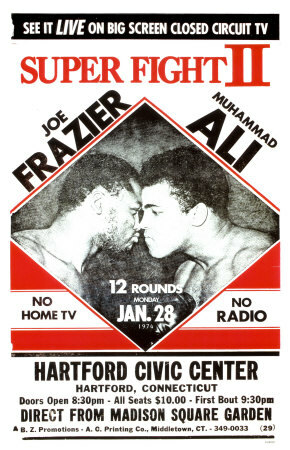 After the legendary "Thrilla In Manila," the rubber match against Frazier, who some have deemed, the greatest boxing match ever, Ali fought and lost to young Olympic Champion Leon Spinks. A rematch followed shortly thereafter in New Orleans, which broke attendance records. Ali won by unanimous decision making him the first heavyweight champion to win the belt three times. Ali has inspired millions worldwide. He gave people hope and proved that anyone could overcome insurmountable odds. He gave people courage. He made fighters of us all. This is Ali and never comes another.